1. 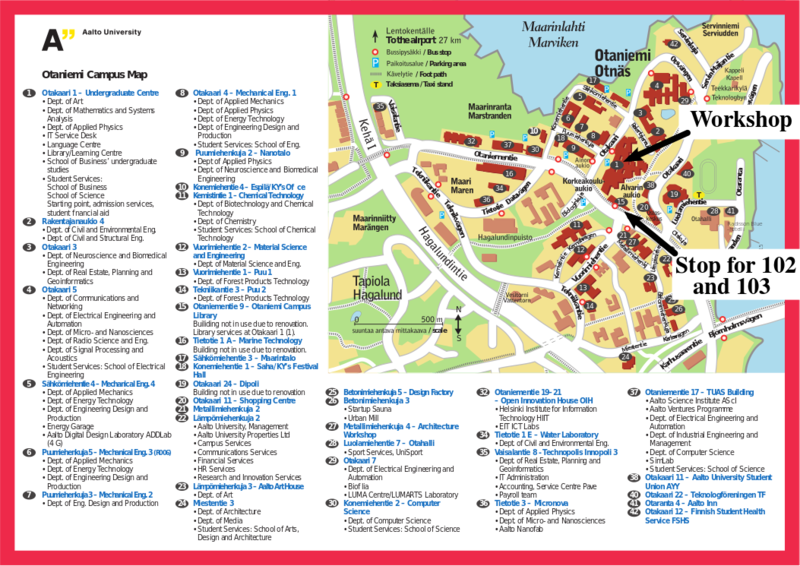 From stop: Apollonkatu (1308), near Toolo towers, take buses No. 14 or 14B or 18 or 39 or 39A or 41 or 42 or 45, or tram No. 2, and get off at stop: Kamppi. 2. Then from Kamppi (basement) either take bus No. 102 or 102T or 103 or 103T and get off at stop: Alvar Aallon puisto (E2229). If you take bus No. 102 or 103 it takes about 16 mins to reach the workshop, and if you take bus No. 102T or 103T it takes about 23 mins. 1. From stop: Alvar Aallon puisto (E2226) take bus No. 102 or 102T or 103 or 103T, and get off at the last stop in Kamppi. 2. Go outside Kamppi and take bus No. 14 or 14B or 18 or 39 or 39A or 41 or 42 or 45, or tram No. 2, and get off at stop: Apollonkatu (1307) (near Toolo towers). To see the bus timetables you can visit bus timetables. For more information you can also visit here .